I love Dave Stevens’ creation The Rocketeer and have followed it from Pacific comics to IDW’s deluxe Artist’s Edition and every stop in between. 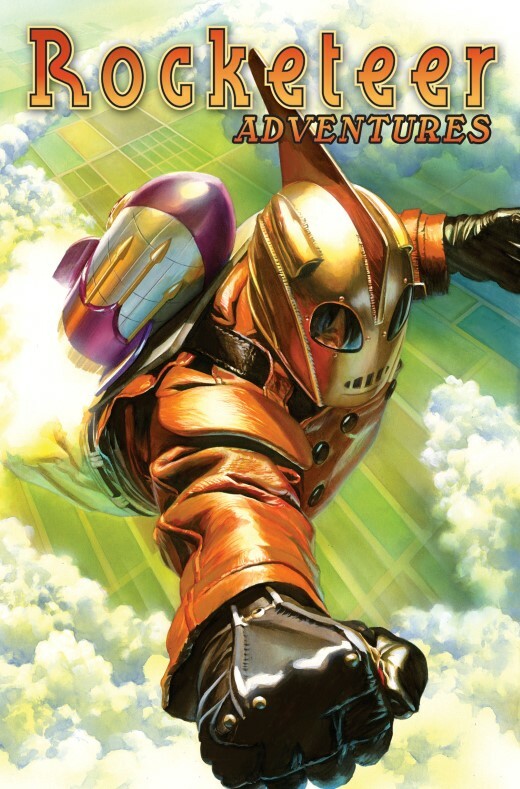 Recently new stories by today’s top talents have been collected in Rocketeer Adventures Volume 1. Dave Stevens’ The Rocketeer was an instant hit the moment it hit the spinner racks in the early 1980s. After the untimely passing of Stevens several years ago, many thought there would never be another Rocketeer story. But, with the full cooperation of the Stevens family, IDW has produced an anthology book that utilizes the talents of many of comics’ top creators, a veritable Who’s Who of writers and artists, and each one a labor of love to Dave and his greatest creation! *Note – All direct market copies of this book will have a dust jacket, exclusive to the direct market, and only available on the first printing! Mike Allred, John Arcudi, Kurt Busiek, John Cassaday, Darwyn Cooke, Lowell Francis, Dave Gibbons, Joe R. Lansdale, Joe Pruett, Jonathan Ross, Ryan Sook and Mark Waid (writers) Mike Allred, John Cassaday, Darwyn Cooke, Tommy Lee Edwards, Gene Ha, Scott Hampton, Tony Harris, Michael Kaluta, Brendan McCarthy, Ryan Sook, Bruce Timm and Chris Weston (artists) Alex Ross (cover). Here we have a solid collection of eleven comic stories and one illustrated prose story, plus twenty pin-ups. Everyone presented their take on The Rocketeer and its cast of characters. 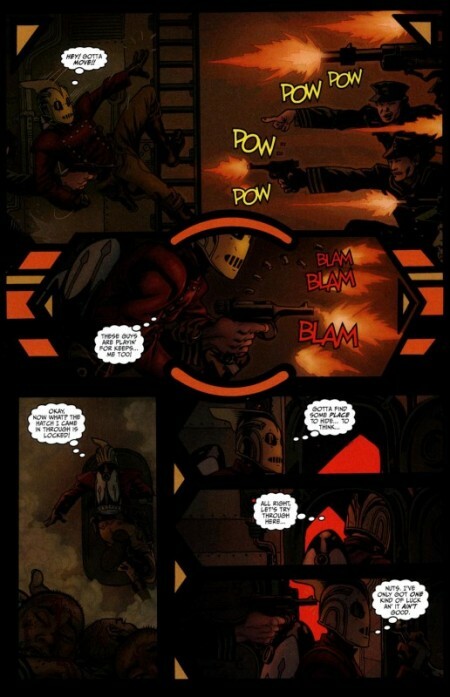 What that boils down to are a series of fun seven or eight page pulp-style romps in the Rocketeer universe. It’s a good length because Stevens didn’t really have a chance to develop these characters and their world beyond his initial stories, and allowing all these creators into the sandbox could be a nightmare. What we end up with are two groups of stories: those that stay true to the character and riff on something Stevens had going, and those that work the characters in new twists. The latter are the best and make an impact, while the former are fun, light entertainment. 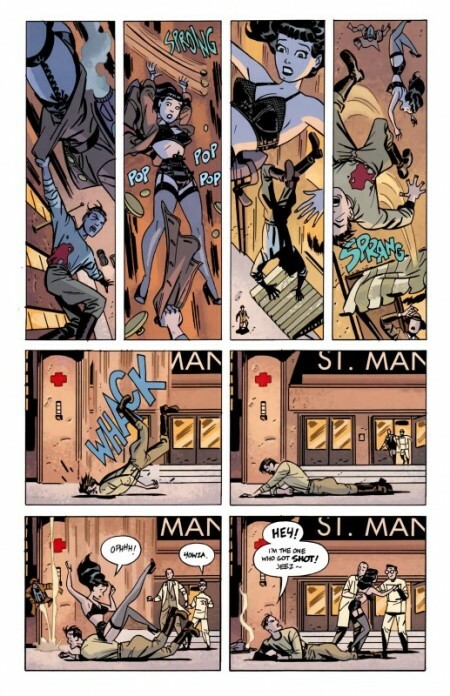 Standouts are Dear Betty… by Kurt Busiek and Michael Kaluta, Betty Saves The Day by Darwyn Cooke, and Junior Rocketeers by Jonathan Ross and Tommy Lee Edwards. Each of these goes beyond Cliff buzzing around with his jetpack fighting bad guys: they focus on Betty and give us a look at the Rocketeer from her perspective. 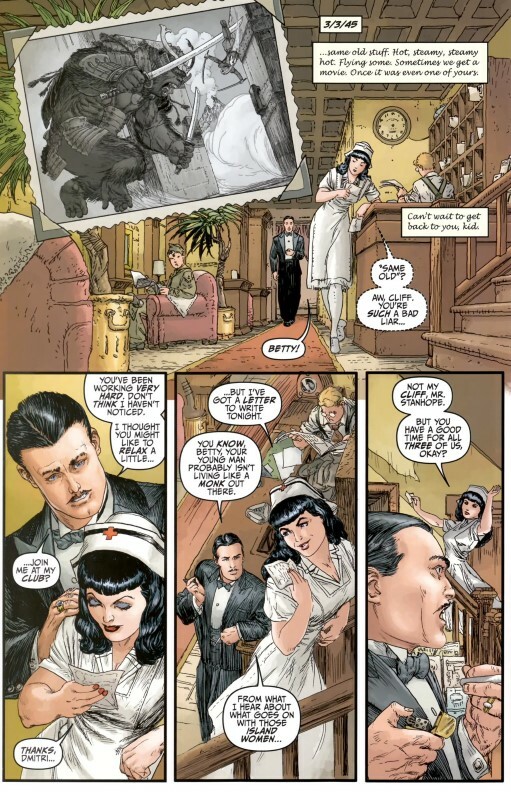 Dear Betty only features the Rocketeer in snippets of photos that Betty receives as he fights overseas during the war; it follows her struggles and affections stateside. Betty Saves The Day has Cliff in trouble and Betty using the jetpack and saving everyone’s bacon, told in movie serial style with wonderful results. Junior Rocketeers has a fan group of kids getting into the middle of it and their girl member taking the spotlight, with help from Betty. Waterlogged, written by Joe Pruett and drawn by Tony Harris, to my mind took Cliff and the Rocketeer outside his world and into someplace dark and violent. He boards a Japanese sub off the coast and kills everyone on board, no hesitation or remorse as he says “these guys are playin’ for keeps…me too!” ; it just doesn’t fit with the Rocketeer as we know him. Rocketeer Adventures Volume 1 is a solid value at $25 with a rich and varied cast of creators. Extras include pinups and short creator biographies. Stories are divided by Alex Ross’ original covers, both their penciled and painted versions, along with Dave Stevens artwork. Let me rephrase: this collected edition has no extras; what’s included at the back of the volume are items that were part of the four issue mini series, reorganized.